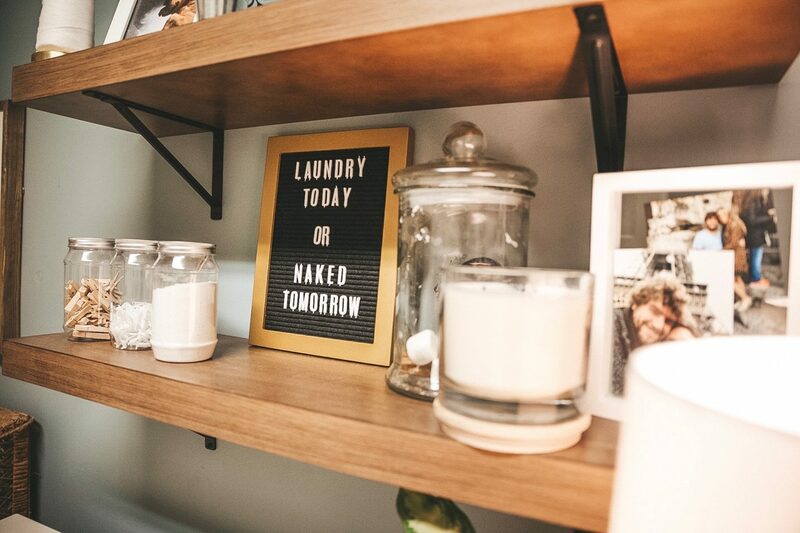 Signs you’re turning into a true adult: you care about how your laundry room looks. Yup, I’m officially entering my late twenties. I care about my DIY laundry & mudroom for a few good reasons though! First, you always see it. 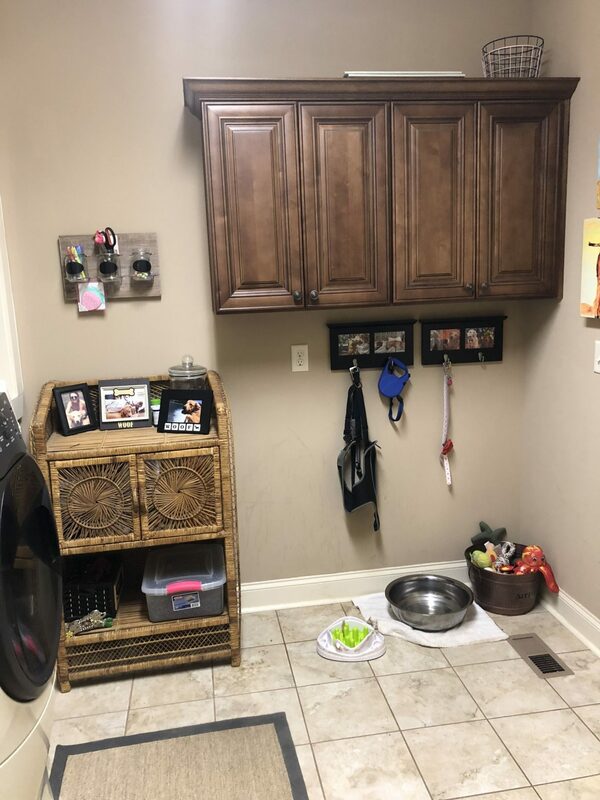 It houses all the dog’s items (like water/food bowls, toys, food, etc. ), it also houses our paper products (toilet paper, paper towels, etc.) and our medicine. 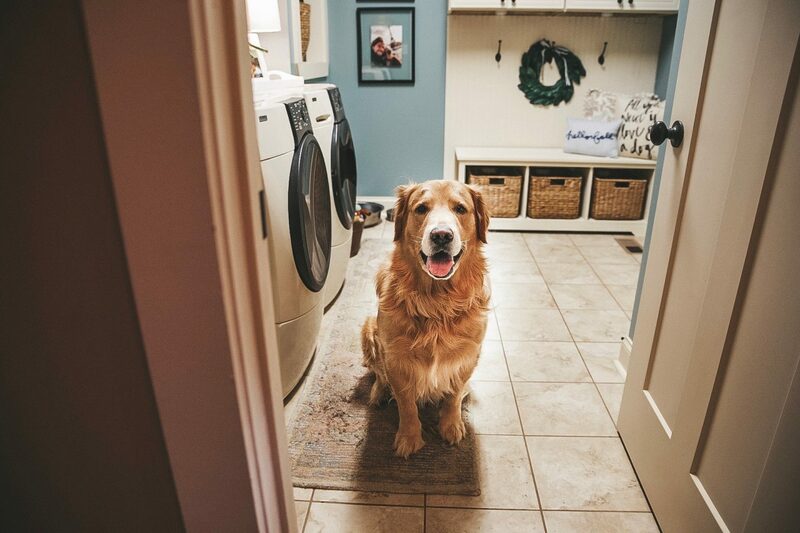 Since the dog’s water is in there, we can never close the door, meaning you see it even if you come in our front door. If you enter from our garage, you walk through it as well. So, it’s unavoidable. And, I love every inch of our house, so I wanted to make this another functional, enjoyable space! All that being said, I still couldn’t bring myself to spend thousands on a laundry & mudroom makeover. SO We set out to accomplish this DIY makeover on a budget and I’m actually very pleased with our results. I’m going to break down a few ways you can make this DIY project work in your house no matter how much space you have! 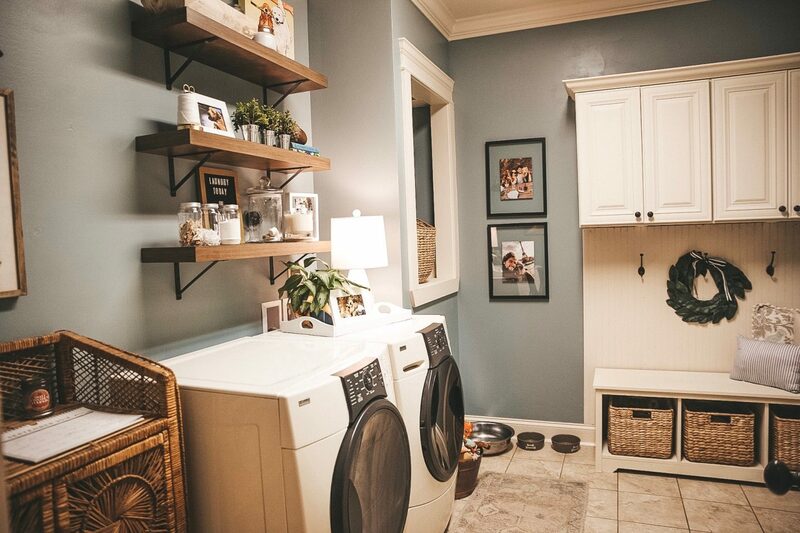 Not looking to work on your laundry room, check out more of #HomeSweetSitton here. Paint. 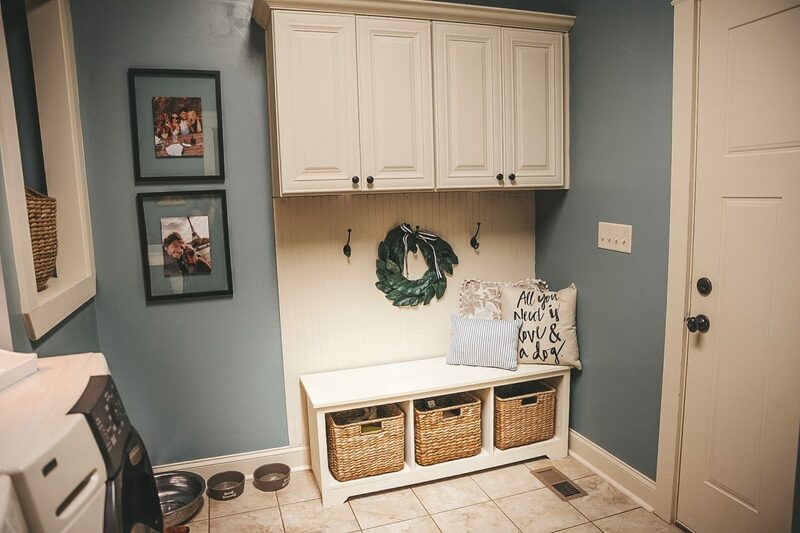 Painting was one of the first things that inspired this DIY laundry & mudroom makeover. Like I mentioned, the dogs’ water is in here, meaning Dallas shakes and get slobber everywhere. Our previous paint was flat and caught every water drop and staining our walls. We repainted with a semigloss. We ended up going with Valspar Cafe Blue and we are so happy. It cleans up so well. Plus, the blue is just enough of a pop to make a statement. 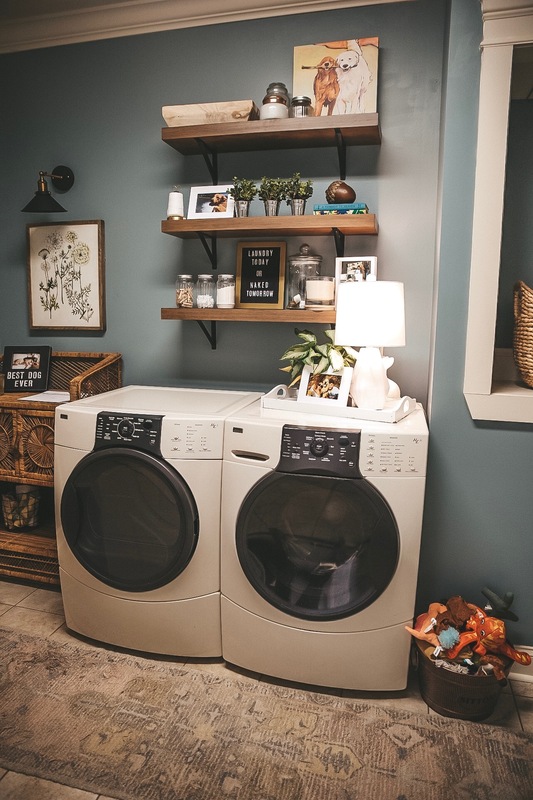 If you don’t have an entire room dedicated to your laundry room, you can still use paint to make a statement, do an accent wall or paint the outside of your door. Replacing Shelves. We bought our house brand new, but we came in too late to make any construction changes. I am not a huge fan of these wire shelves, so I’m slowly replacing them room by room. We got our floating shelves at Lowe’st but they were a little more than I would have liked to pay, these are very similar and a much better price. 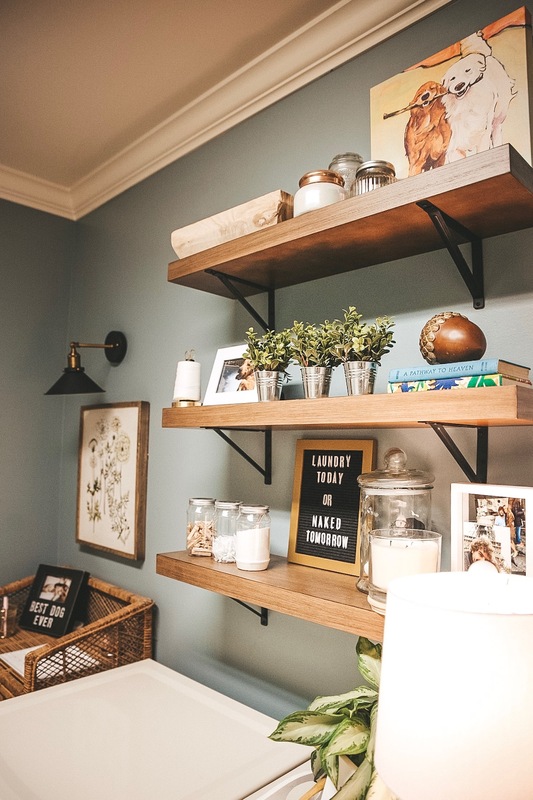 Even if you don’t have shelves to take down, adding shelves creates both style and function! Be sure to think out of the box when styling them. 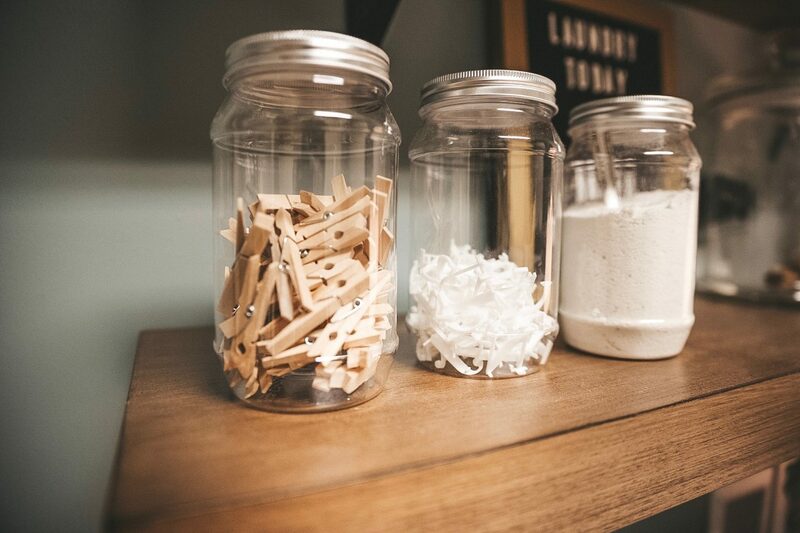 I added things like mason jars with detergent, clothes pins and letterboard letters. You can also use jars to house items you need like extra buttons, sewing essentials, etc..
Magic Light. This is a trick I learned from a blogger I love to follow (@NestingWithGrace). It’s basically a hack to add sconce lighting without having to wire anything. This is a GAME CHANGER if you’re renting or just don’t want to do major construction like us. 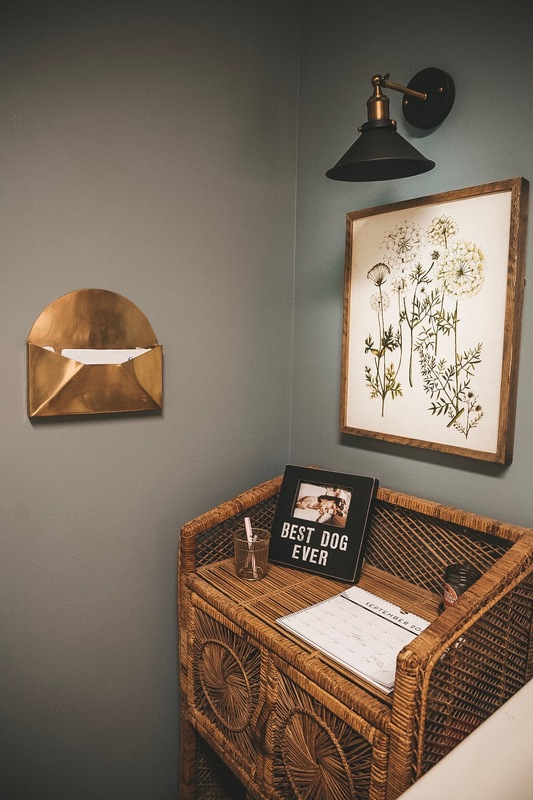 This will work with any sconce that does not have a clear globe over the lightbulb, Amazon is my favorite place to shop them (see more here). I will share a full blog post on this, but basically, you hang the light like normal, without attaching any wiring and then use one of these lights instead of a light bulb! It truly is magic! 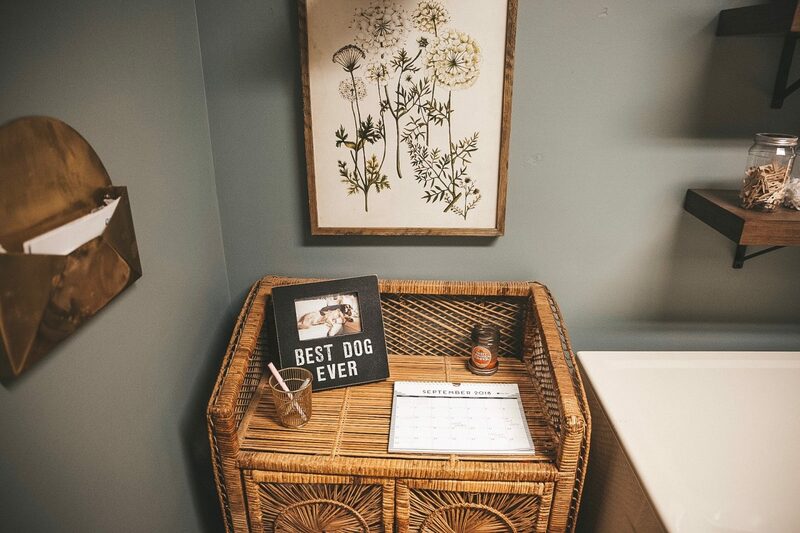 We wanted to put ours over a painting but these would be adorable in so many parts of your home, I can’t wait to add more. DIY Laundry & Mudroom Landing. This is a little hack that can majorly enhance any entryway. Coming in from our garage, I wanted to have a landing space. Somewhere for our purse, coats, shoes, etc.. Solution: a bench area! When we bought this house, we had these cabinets in our laundry room and I still cannot figure out why! If you know, please tell me! 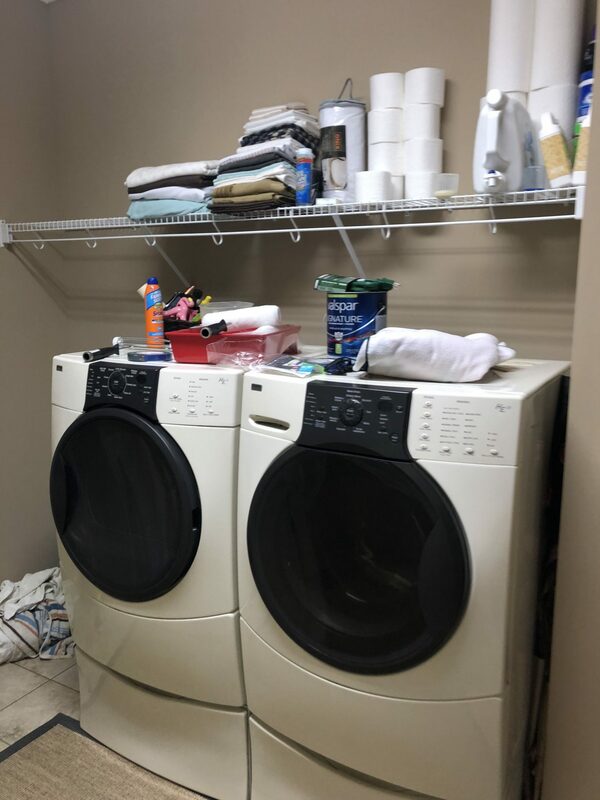 They aren’t for the washer and dryer, because the hook up was on a different wall. RJ says they were probably extra. Anyway, we decided to turn this area into a DIY faux built-in bench. It really didn’t take much at all and was a huge impact. I ordered this bench (under $100!) 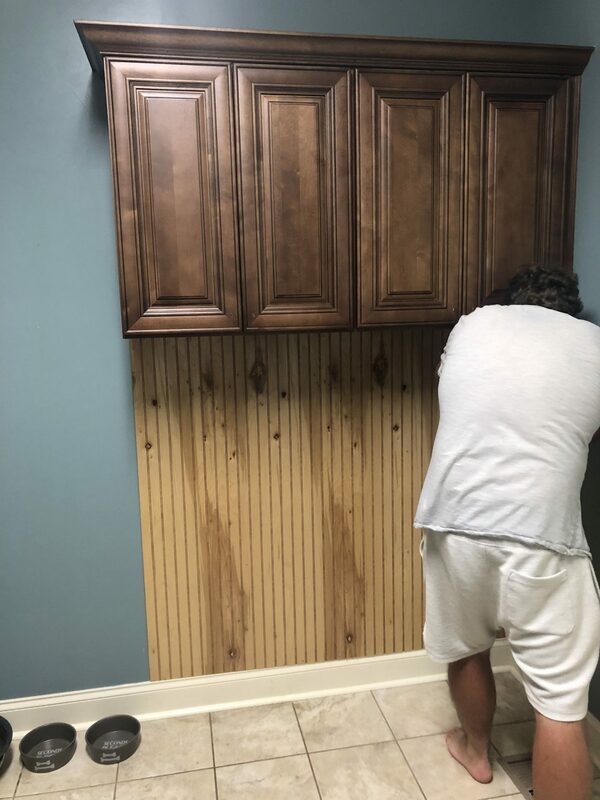 and added bead boarding (just cut to our exact measurements and drilled into the wall), painted both + the cabinets the same color as the trim and then finished off with hooks and pillows! It truly was so simple. If you don’t have space for a full bench, you could do something like this piece. Accessorize & Personalize. 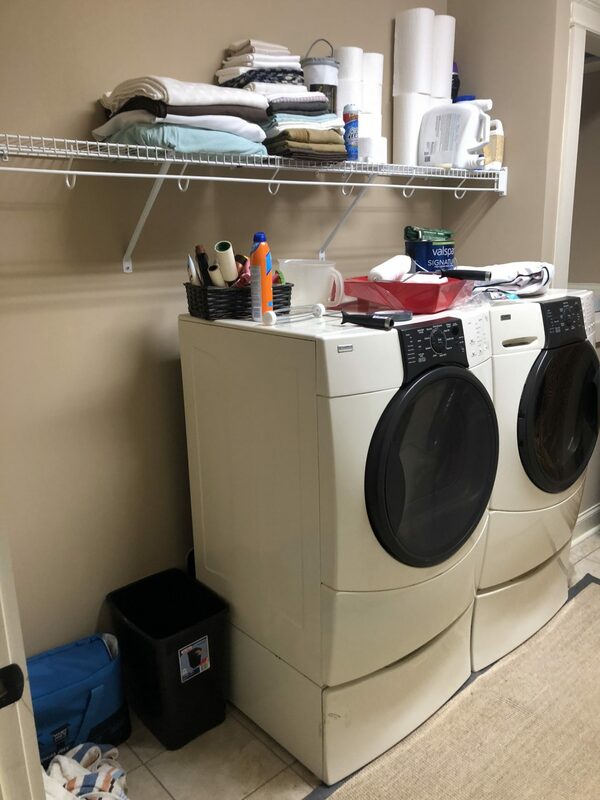 No matter what size space you have, just because laundry is boring doesn’t mean your space has to be! 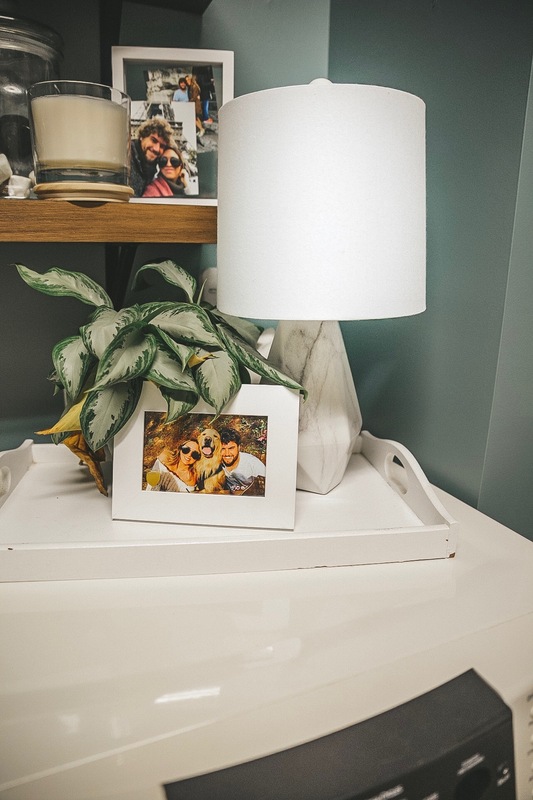 Add photos, fun trinkets, and even holiday decor. We personalized with a great runner and two of my favorite photographs ever. It really creates an inviting space for all our visitors. 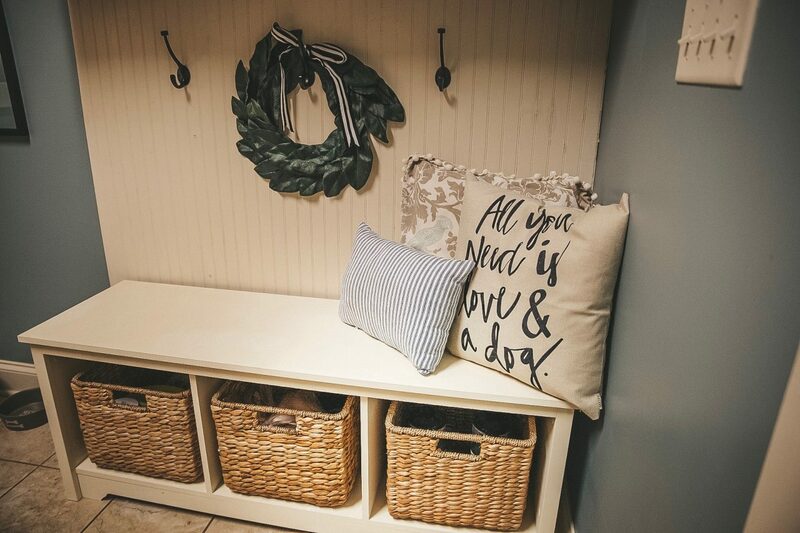 I added a laundry & mudroom board to my Pinterest and will be pinning different examples of what I did for all size and types of spaces, be sure to follow along for ideas for your own home. Home Organization Hacks Under $60! Next Post Easy Makeup Routine – Fifteen Minute Face! This is absolutely amazing!! 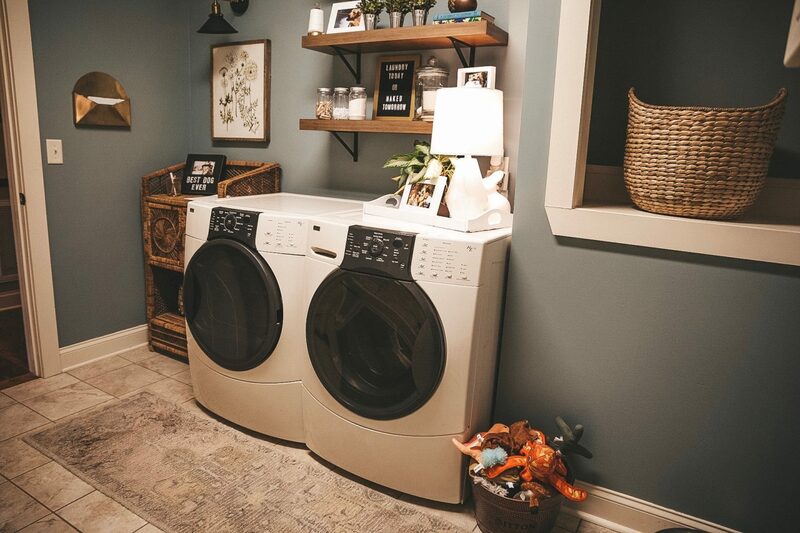 Who knew a laundry room could be so inviting (and appealing). I need to figure out how to implement some of your recs in my own laundry room 🙂 Thank you for sharing!